In the analog and digitized age, every generation has reached (or will reach) a point where they listen to what is touted as The New and Original yet internally say to themselves, “That sounds a heckuvalot like [insert name of artist from previous generation here]…” To the naive (or the really naive since naivete is a matter of degrees — this means, deep down, we all have a little naivete in us no matter the age), this can be particularly disturbing since it seemingly undermines the illusion or construction of the word known as originality. Yet mimicry — supposedly an abandonment of originality — is easily one of the greatest forms of flattery (and it can also be one of the greatest forms of mockery — it’s a matter of presentation, perception and reception). In our digital Web-based world (currently at Web 2.0 and poised to push into Web 3.0), this idea of the new and original is not, in fact, new or original. Take any profession — the Rock Star profession notwithstanding — and trace the history of its intellectual or artistic trajectory. Without too much researching effort, this rather quickly demonstrates how forerunners and pathfinders benefitted from the ideas of their predecessors. This, for example, is why Lewis and Clark and the Corps of Discovery just didn’t come on the scene and heroically discover the Pacific Ocean (trust me, it’s pretty large and hard to miss if you just keep heading west; and W. Raymond Wood speaks at length as to how L&C benefitted from several mapping and exploring predecessors); or why Nirvana didn’t create “Where Did You Sleep Last Night” one day on MTV Unplugged — that was Lead Belly, and as Wikipedia informs me Lead Belly was merely reflecting an 1870s American folk song of Southern Appalachian origin. 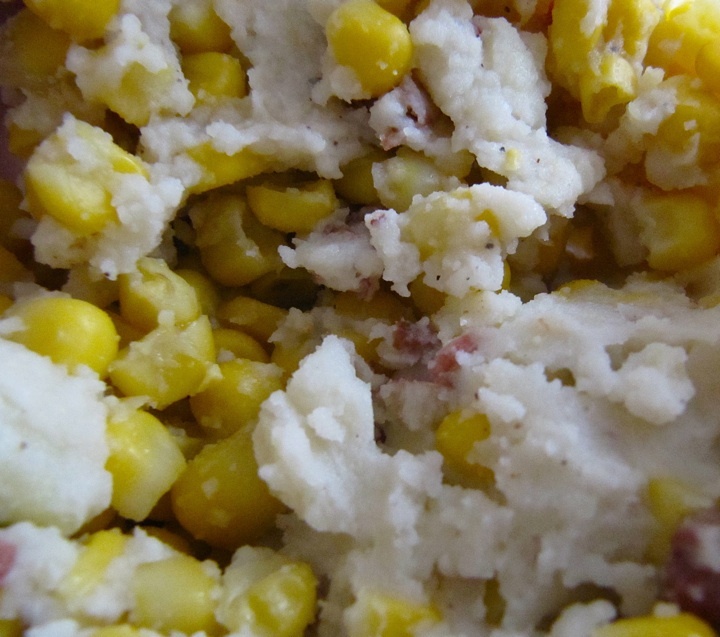 A Mashup of potatoes, sweet corn, garlic, butter, salt and pepper. So this leaves us with the ways in which humanity rebrands and repackages seemingly old ideas, or combines several old ideas to form something anew. In Web-2.0 Speak, this comes by way of the words Mashups and Remix. In Web 2.0 for Librarians and Informational Professionals (New York: Neal-Schuman Publishers, Inc., 2008), Ellyssa Kroski defines Mashups as follows: “Hybrid Web applications created by combining two or more distinct sets of data or functionality to form something new.” Brian Lamb defines the remix as “the reworking or adaptation of an existing work,” noting varying degrees of subtlety, but how “efforts are focused on creating an alternate version of the original.” So you just take old stuff, or stuff that’s lying around, and slap this or that together to make something new and — with any bit of artistic ingenuity or luck — quite beautiful or useful, philosophically or technically. On the northern Plains, several in-your-face Mashups and remixes come in the form of 1) University of North Dakota’s Chester Fritz-at-50 site; 2) the Digital Horizon site; 3) the Theodore Roosevelt Center at Dickinson State University; and 4) the horizontal fracking technology honed in Canada and deployed in western North Dakota and eastern Montana (as of November 9, 2011, we’re still very curious as to what is in the fracking slurry that is pumped underneath us on the northern Plains). And this raises other points, especially when it comes to copy and property rights. With digitized songs and artifacts, the way in which the digital resources can be re-used, recycled and re-analyzed again and again is infinite. When it comes to fracking and acquiring petroleum, however, the resource is finite — in effect, oil cannot be digitized and reused, and the companies pay the mineral right owners to de-value their land through the extraction and exploitation of those finite resources (until theoretical chemists and physicists can give us clean endless power and energy, there will always be a market for energy resources). This entry was posted on Wednesday, November 9th, 2011 at 12:10 pm	and posted in Uncategorized. You can follow any responses to this entry through the RSS 2.0 feed.